28 Billion new scandal in the Jubilee Government from the Dubai Loan meant to expand Mombasa Port.. - Bana Kenya News, Real African Network Tubanane. Home featured 28 Billion new scandal in the Jubilee Government from the Dubai Loan meant to expand Mombasa Port..
28 Billion new scandal in the Jubilee Government from the Dubai Loan meant to expand Mombasa Port..
A new scandal that has been revealed by the opposition secret agents about the Naivasha inland port. 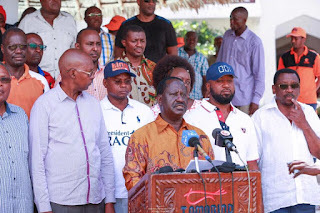 The ODM leader has claimed that the Government lost around 28 Billion from the United Arab Emirates loan(Dubai Loan). The Opposition leader claimed that he has evidence of the looted funds and urged the Jubilee government to come out Clean if it is a mere allegation. A whiff of corruption hangs all over the KES 28 billion shilling so-called loan from the Government of the United Arab Emirates as it leaves more questions than answers. "We are here to seek very specific answers from none other than the President of the Republic of Kenya Mr Uhuru Kenyatta." said the Opposition Leader. According to the ODM leader Raila Odinga, the government flouted the tendering processes and gave it the worst bidder. The main reason was to get the money and give to some officials for unknown purposes. The cash was also to be used by the government to construct the Naivasha inland port and that is the main reason why the Jubilee Government borrowed as fast as possible to construct the railway's line. The main benefit is for the Kenyatta family not for the whole country claimed the ODM leader.